With motorcycle riding season upon us, there's no better time to go over some of the top tips that will help you save money on your motorcycle insurance. If you're new to riding, then take an approved rider training course. Not only will you be a better rider for it, but you could be eligible for a discount that will lower your motorcycle insurance premium. How you ride and drive will affect your insurance premiums. Multiple tickets and/or collisions—whether on two or four wheels—will increase how much you pay for your motorcycle insurance. With a spotty driving record, you can find yourself paying a lot of extra premium over the years. How do you pay your premiums? If you pay your premiums monthly, you may be paying more for your coverage than if you paid it in one lump sum. Some companies charge a little extra to cover the cost of administering payments every month, so if you can pay your premium in full you'll avoid these annoying extra fees. Many riders think they are saving money by cancelling their insurance on the motorcycle during the winter months. The truth is that motorcycle insurance in Canada is seasonal and the premiums are seasonally adjusted. Insurance companies know you don't ride in the winter, and they work their rates out to allow for that. There are a wide range of anti-theft devices designed specifically for motorcycles and some insurance companies will offer you a discount if you have an approved one professionally installed on your bike. 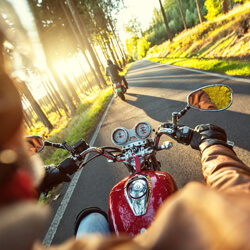 The type of bike you choose will affect your motorcycle insurance rate. For example, motorcycles designated as "sport" bikes can carry a premium surcharge making it more expensive for coverage. Other details that may affect your premium include the size of the engine (in cc's), the retail price of the bike, and the value of any modifications or customizations. When buying a motorcycle, you'll spend plenty of time shopping around for the right ride, just make sure you set aside some of your time to compare motorcycle insurance quotes as well to make sure your bike fits your budget. Is your home insurance or auto insurance policy with the same insurer who covers your motorcycle? Insurance companies often offer clients who have more than one policy with them a discount and the discount can range from five to 15 per cent off one or more of the policies. If you have an older bike, you may want to think about dropping the collision and/or comprehensive coverage that you may have on your policy. You need to think about this one though and speak to your insurer about it because it means you'll be on the hook for damages to the bike in the event you're involved in a collision or if your bike is stolen. The only way to make sure you are getting the best price for your policy is to shop around. See if you could spend less on your motorcycle insurance. The open road is calling for a better deal, and Kanetix.ca can help you shop around for a better price.